Herman Li is best known as one of the guitarists for the ludicrously upspeed power metal band DragonForce. Chances are you already knew that, though. His claim to the spotlight was anything but subtle. Back in the mid-2000s he, along with DragonForce bandmate Sam Totman, pretty much blew up thanks in large part to their absolutely absurd speed. Nowadays DragonForce is a household name in modern metal and you know what that means? Signature guitars. Cue Herman Li’s Ibanez EGEN8. 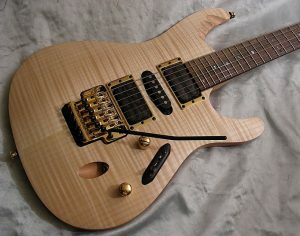 After three years of development the powers of Herman Li and Ibanez combined yielded the EGEN8. The body shape is among Ibanez’s more Strat-like designs, though the body is built of mahogany and features a flamed maple top, and some finger grooves have been scalloped into the top horn for good measure. Fun fact: The scalloped finger grooves are modeled after Herman Li’s right hand. Can you believe it? Additionally the neck is maple with a rosewood fretboard. 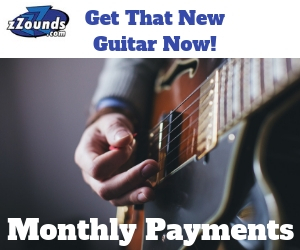 Should you find yourself at all curious the guitar comes armed with an alnico V8 humbucker at the bridge for a warmer sound, an alnico S1 single coil in the middle for which is wired to be better suited with the humbuckers in split positions, and a ceramic V7 at the neck which garners a much brighter sound. Should you find yourself to any extent curious it also comes armed with an Edge III tremolo, and for that extra touch of class all hardware is gold. For what a randomly placed opinion is worth I credit the gold hardware to blending nicely with the natural finish of the guitar. 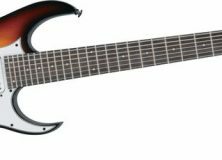 In addition to the EGEN8 there is the EGEN18 model which is for the most part the same guitar, save for a few alterations here and there. The most obvious alteration is the transparent violet finish, but that’s just the skin deep of it. 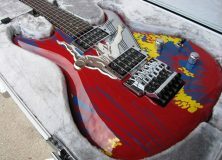 The neck also has the highest four frets scalloped, and instead of an Edge III tremolo the EGEN18 has an Edge Zero tremolo. 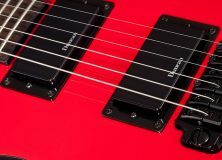 There are also three DiMarzio pickups with a high output ceramic HLM-B humbucker at the bridge, a awrm HLM-S ceramic single coil in the middle, and a warm ceramic HLM-N humbucker at the neck. The volume knob also has a coil tap switch that splits the humbuckers and offers five additional pickup settings.